In this study, a modified silica gel surface with a hydrophobic ionic liquid (SG-1,10-PhenanNTf2) was used as an adsorbent for a selective extraction of coumarin prior to its determination by use of high performance liquid chromatography. Results demonstrated that SG-1,10-PhenanNTf2 phase had a good adsorption capacity up to 85.29 mg∙g−1, high selectivity, good site accessibility and fast binding kinetics toward coumarin. The adsorption capacity for coumarin was improved by 62.33% with the SG-1,10-PhenanNTf2 phase as compared to activated silica gel. Adsorption isotherm data displayed that the adsorption process was mainly monolayer on a homogeneous adsorbent surface, confirming the validity of Langmuir adsorption isotherm model. The adsorption of coumarin on the SG-1,10-PhenanNTf2 phase was accomplished after only 60 min contact time. Results of kinetic models showed that the adsorption of coumarin on the SG-1,10-PhenanNTf2 phase obeyed a pseudo second-order kinetic model. Finally, the efficiency of this methodology was confirmed by applying it to real water samples. Most of organic compounds have a limited solubility in water and as a result they exist only at ultra concentrations level. Direct determination of these compounds in different kinds of environmental samples is often a challenging task for analysts. Also, it may cause serious interferences during measurement because of the lack of sensitivity and selectivity of analytical methods. In addition, a clean-up step is often required because of high levels of other components usually accompany the target compound. Therefore, an efficient extraction step is often necessary for accurate, sensitive and interference-free determination. There are several extraction techniques, including liquid–liquid extraction [1,2], ion exchange , accelerated solvent extraction , cloud point extraction , supercritical fluid extraction  and solid phase extraction (SPE) [7,8]. However, SPE is one of the most widely and commonly used techniques for pre-treatment of environmental samples. This is attributed to its advantages of higher enrichment factor, absence of emulsion, safety with respect to hazardous samples, minimal costs due to low consumption of organic solvent, environment friendly, flexibility and easier incorporation into automated analytical techniques . Moreover, several adsorbents have been used as solid phase extractors, such as alumina , activated carbon , carbon nanotubes , cellulose , C18 , resins , molecular imprinted polymers  and silica gel [16-19]. Silica gel (SG) is one of the most widely used adsorbent due its simple handling, high surface area, fast kinetics, mechanical, thermal and chemical stability under various conditions . It is also an efficient adsorbent for the extraction and separation of various types of compounds. However, adsorption of organic compounds at ultra-trace levels by SG alone cannot be directly achieved, and it is often necessary to modify the SG with chelating agents for enhancing its selectivity and capability for monitoring organic compounds in the environment. Ionic liquids (ILs) have recently gained recognition as in different chemical fields due to their unique properties and their potential as greener solvent for many organic, inorganic, and polymeric substances as compared to the traditional organic solvents which are toxic and environmentally harmful [21,22]. Because of their unique properties, the applications of ILs have been expanded in various fields, such as solvent extractions , liquid-liquid extractions [24,25], enzymatic reactions , pharmaceutical studies , electrochemical studies , dye-sensitized solar cells and batteries [29,30], gas sensors for detection of polar and non-polar organic vapors , supported electrolytes in capillary electrophoresis, mobile phase additives in liquid chromatography and stationary phases in gas-liquid chromatography [32,33]. In addition, ILs can be physically adsorbed onto solid phase extractors surface by electrostatic interaction due to their high viscosities and negligible vapor pressure . Several studies have described the efficiency of ionic liquid functionalized silica as an adsorbent for selective extraction of organic compounds [35,36]. However, finding a selective chelating agent capable to selectively bind to the target compound is one of the problems often encountered in applications of ILs for organic compounds extraction from various matrices using different extraction methods. In accordance, the present study was purposed to explore the analytical potential of SG-1,10-PhenanNTf2 phase as an adsorbent on the selectivity and adsorption capacity of coumarin prior to its determination by high performance liquid chromatography (HPLC). The SG-1,10-PhenanNTf2 phase has already been proven to be an effective adsorbent for selective extraction of Pb(II) prior to its determination by use of inductively coupled plasma-optical emission spectrometry in our previous study . The preparation of the adsorbent was accomplished by combining a hybridization process of the hydrophobic ionic liquid characters with high adsorption efficiency and surface area of SG. The resulted SG-1,10-PhenanNTf2 adsorbent was characterized by use of Fourier transform infrared (FT-IR) spectroscopy and scanning electron microscope (SEM). The selectivity of SG-1,10-PhenanNTf2 toward several organic compounds was investigated. In addition, the effect of different factors controlling the maximum uptake of coumarin on the SG-1,10-PhenanNTf2 phase was studied under batch conditions. Langmuir classical adsorption isotherm model accurately represented the results of coumarin adsorption isotherm. Results of the kinetic analysis also demonstrated that the adsorption process obeyed a pseudo second-order adsorption model. Furthermore, the efficiency of this methodology was validated by applying it to real water samples. 1,10-Phenanthroline monohydrate hydrochloride (1,10- PhenanCl), bis(trifluoromethane)sulfonimide lithium (LiNTf2), coumarin, 4-chloroaniline, flavone, 9-fluorenone, isatin, naphthalene, phenanthrene, phenazine, phenazone and HPLC grade acetonitrile (ACN) were purchased from Sigma-Aldrich (Milwaukee, WI, USA). SG (SiO2, particle size 10 - 20 nm) with purity of 99.5% was also obtained from Sigma-Aldrich. All reagents used were of analytical and spectral purity grade. Doubly distilled deionized water was used throughout experimental studies. SG-1,10-PhenanNTf2, as shown in Scheme 1, was synthesized according to previously reported procedures by Marwani [37,38]. Specifically, the SG-1,10-PhenanNTf2 phase was prepared based on the physical adsorption of hydrophobic ionic liquid (1,10-PhenanNTf2) on the activated SG surface. An amount of 5 g activated SG was suspended in 100 mL toluene, and 1g 1,10-PhenanNTf2 was completely dissolved by warming in 50 mL toluene and added to the activated SG suspension. The reaction mixture was heated and stirred at 60˚C for 12 h. The modified SG-1,10-PhenanNTf2 phase was filtered and washed with 50 mL toluene on three portions followed by ethanol and diethyl ether. Then, the SG-1,10-PhenanNTf2 adsorbent was dried in an oven at 80˚C for 5 h and kept in a desiccator for further use. The concentration of 1,10-PhenanNTf2 ionic liquid on the surface of activated SG was determined to be 0.25 mmolg−1 based on thermal desorption method . Scheme 1. Chemical structure of the SG-1,10-PhenanNTf2 phase . conditions but at different equilibrium periods, including 2.5, 5, 10, 20, 30, 40, 50 and 60 min. The concentration of each substrate solution was monitored by HPLC and calculated from the calibration plot of the peak area as a function of the concentration. 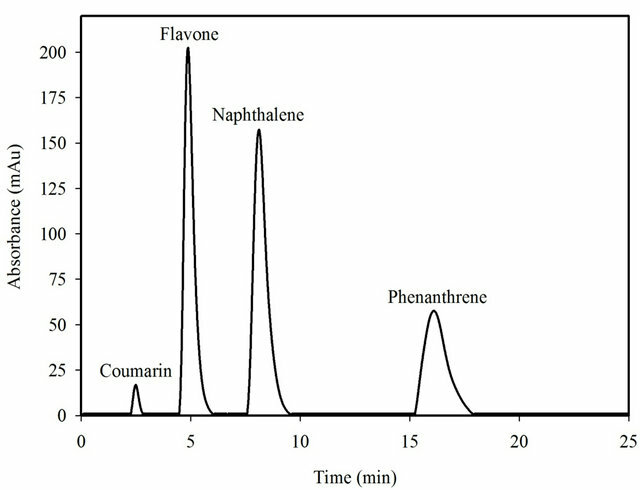 For the study of the effect of matrix interferences on the extraction of coumarin by SG-1,10-PhenanNTf2, a standard solution of 150 mg∙L−1 coumarin, flavone, naphthalene and phenanthrene was prepared and mixed with 20 mg SG-1,10-PhenanNTf2. The mixture was then mechanically shaken for 1 h at room temperature. SEM studies were performed before and after modification of the SG phase by use of a field emission-scanning electron microscope (FE-SEM, QUANT FEG 450, Amsterdam, Netherlands). The microscope was operated at an accelerating voltage of 15 kV. HPLC measurements were acquired by use of an Agilent Technologies 1200 Series, USA. The chromatographic system consisted of a model G1361A pump and G1315B DAD UV detector. All separations were achieved on an analytical reversed phase column (ZORBAX ODS, 4.6 × 150 nm) with a flow rate of 1 mL∙min−1, and the volume of sample injection was 20 μL. An isocratic elution was established with a mobile phase composition of 60% ACN and 40% water at room temperature. The UV detector was operated at wavelengths of 198 nm for 4-chloroaniline, 252 nm for 9-fluorenone, 215 nm for naphthalene, 251 nm for phenanthrene, 244 nm for phenazine, 243 nm for isatin and phenazone and 203 nm for coumarin and flavone. FT-IR spectra confirmed the formation of the physically modified phase (SG-1,10-PhenanNTf2) as previously reported elsewhere . In addition, SEM images were taken for activated SG and SG-1,10-PhenanNTf2 in order to further confirm the formation of the physically modified SG-1,10-PhenanNTf2 adsorbent (Figures 1(a) and (b)). As shown in Figure 1(b), the immobilization of hydrophobic ionic liquid (1,10-PhenanNTf2) on the surface of activated SG resulted in a pronounced and characterized change of the surface morphology of activated SG. It can be noticed that 1,10-PhenanNTf2 collected activated SG particles in aggregate forms that are completely covered with it. 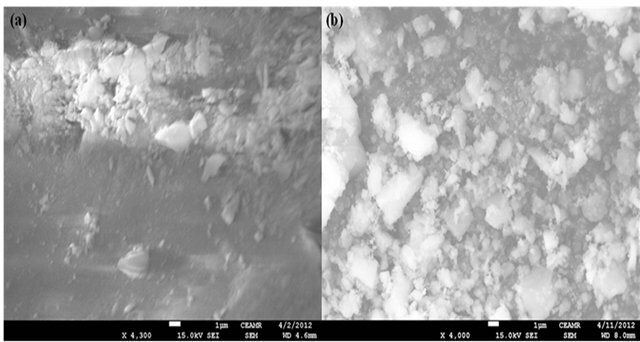 In addition, the SEM image given in Figure 1(b) of the modified SG-1,10-PhenanNTf2 adsorbent clearly displays the particles as individually distributed in uniform and homogeneous shapes as compared with that of activated SG (Figure 1(a)). where Ci and Ce are initial and final concentrations (mg∙L−1), respectively, V refers to the volume of solution (mL), and m is the mass of adsorbent (g). The final concentrations (Ce) were determined based on the calibration plot of the peak area as a function of the concentration. 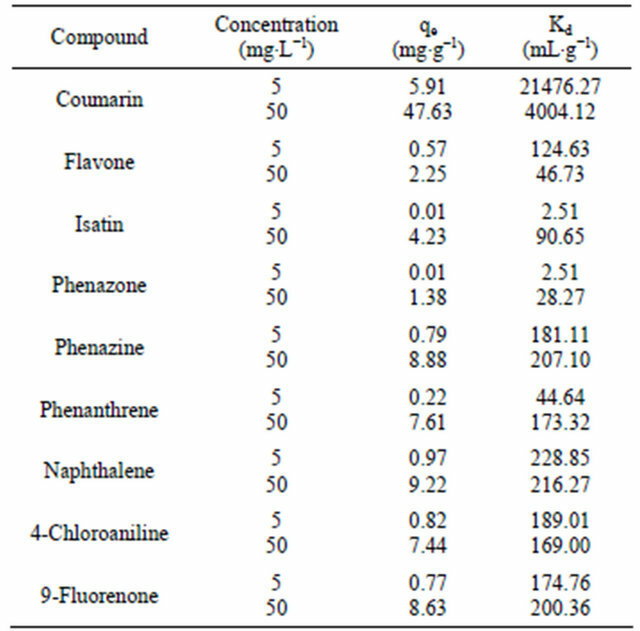 The results displayed that coumarin had the greatest Kd value up to 21476.27 and 4004.12 mL−1 for 5 and 50 mg∙L−1, respectively, on the SG-1,10-PhenanNTf2 adsorbent as compared with other compounds examined on SG-1,10-PhenanNTf2. Therefore, the results of selectivity study indicated that SG-1,10-PhenanNTf2 was most selective for coumarin over all other compounds, including 4-chloroaniline, flavone, 9-fluorenone, isatin, naphthalene, phenanthrene, phenazine and phenazone. 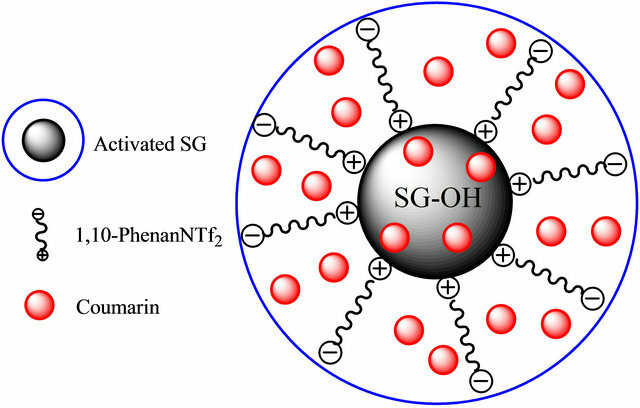 The partial ionic charges produced on the surface of activated SG and incorporated donor atoms (O, N and S) presented in SG-1,10-PhenanNTf2, as a result of immobilization of the 1,10-PhenanNTf2 ionic liquid on the activated SG, strongly attained the selective adsorption of SG-1,10- PhenanNTf2 toward coumarin. Thus, the highest selectivity of SG-1,10-PhenanNTf2 toward coumarin may be attributed to an electrostatic attraction, physical, mechanism between SG-1,10-PhenanNTf2 and coumarin (Scheme 2). Figure 1. SEM images of (a) activated SG and (b) SG-1, 10-PhenanNTf2 phase. Scheme 2. Interaction mechanism between SG-1,10-PhenanNTf2 and coumarin. Table 1. Selectivity study of 20 mg SG-1,10-PhenanNTf2 toward different compounds. In order to evaluate the static uptake capacity of coumarin on the SG-1,10-PhenanNTf2 phase, different desired concentrations of coumarin ranging from 0 to 200 mg∙L−1 in 25 mL sample solutions were mixed with 20 mg SG-1,10-PhenanNTf2. All these mixtures were mechanically shaken for a period of 1 h at room temperature, and the amount of coumarin adsorbed at each concentration level was determined. 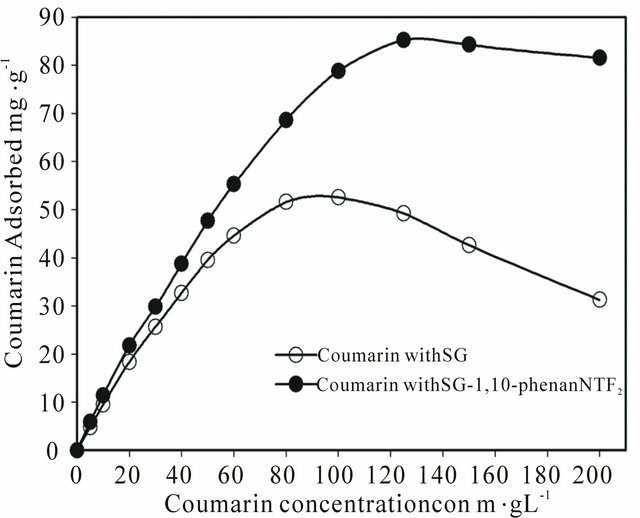 The adsorption profile of coumarin on 20 mg SG-1,10-PhenanNTf2 was obtained by plotting the coumarin concentration (mg∙L−1) versus milligrams of coumarin adsorbed per gram SG-1,10- PhenanNTf2 (Figure 2). 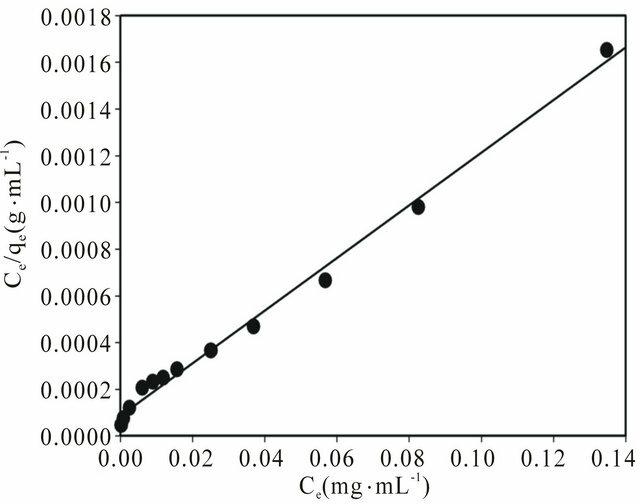 From adsorption isotherm study, the adsorption capacity of SG-1,10-PhenanNTf2 for coumarin was determined to be 85.29 mg∙g−1 (Figure 2), which is the greatest adsorption capacity reached in comparison with adsorption capacity values previously reported for coumarin with other adsorbents (7.17, 10.56 and 10.64 mg∙g−1) . For comparison with the coumarin adsorption capacity of SG-1,10-PhenanNTf2, the coumarin uptake capacity on activated SG was also determined under the same batch conditions (Figure 2). As shown in Figure 2, the adsorption capacity of activated SG for coumarin was found to be 52.54 mg∙g−1. These results showed that the adsorption capacity for coumarin was improved by 62.33% with the modified SG-1,10- PhenanNTf2 phase. Figure 2. Adsorption isotherm of coumarin on 20 activated SG and SG-1,10-PhenanNTf2 phase in relation to the concentration at 25˚C. Figure 3. Langmuir adsorption isotherm model of coumarin adsorption on 20 mg SG-1,10-PhenanNTf2 at 25˚C. Adsorption experiments were obtained at different concentrations (0 - 200 mg∙L−1) of coumarin under batch conditions. where b is the Langmuir constant which indicates the nature of adsorption and the shape of the isotherm, and Co refers to the initial coumarin concentration (mg∙L−1). The RL value indicates the type of the isotherm, and RL values lying between 0 and 1 provided that the conditions were favorable for adsorption . The RL value of coumarin adsorption on SG-1,10-PhenanNTf2 was estimated to be 0.05, confirming that the adsorption is strongly favorable under conditions used in this study. Thus, adsorption data indicated the formation of monolayer on a homogeneous adsorbent surface with a highly favorable adsorption process based on the Langmuir adsorption isotherm model. 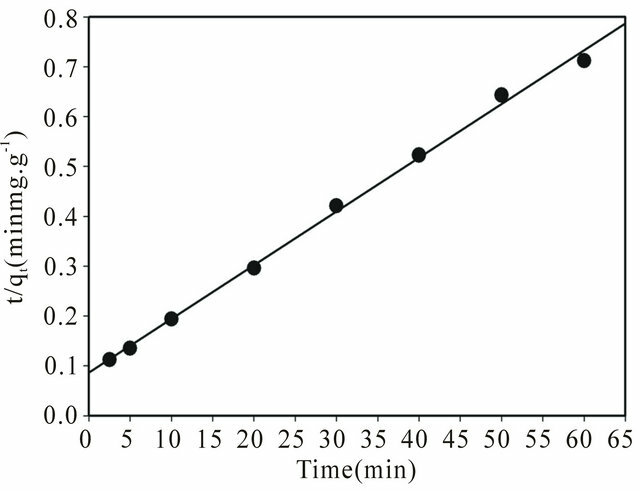 The effect of shaking time is one of the most important factors when using the batch technique in processes of the adsorption capacity determination for organic compounds. In this study, different shaking times were chosen, ranging from 2.5 to 60.0 min, in order to study the behavior of adsorption kinetics for coumarin on the SG- 1,10-PhenanNTf2 phase. Based on the results, it was observed that equilibrium kinetics were very fast. As displayed in Figure 4, an amount of 67.56 mg∙g−1 coumarin was adsorbed on SG-1,10-PhenanNTf2 after only 20 min of the equilibrium period. Then, the amount of coumarin adsorbed was raised up to 76.53 mg∙g−1 after 40 min until the maximum adsorption of SG-1,10-PhenanNTf2 for coumarin was reached to 85.29 mg∙g−1 after 60 min. where is the initial adsorption rate (mg∙g−1∙ min−1) and k2 (g∙mg−1∙min−1) corresponds to the rate constant of adsorption, qe (mg∙g−1) denotes the amount of compound adsorbed at equilibrium, and qt (mg∙g−1) refers to the amount of compound on the adsorbent surface at any time t (min). The parameters qe and υo can be obtained from the slope and intercept, respectively, of a plot of t/qt versus t . The kinetic parameters qe and υo were calculated from the slope and intercept, respectively, of the linear plots of t/qt versus t, as shown in Figure 5. The correlation coefficient (R2) factor was found to be 0.997, providing that the pseudo second-order adsorption is more reliable and accurate. The parameters qe, υo and k2 were determined to be 92.72 mg∙g−1, 11.61 mg∙g−1∙min−1 and 0.0013 g∙mg−1∙min−1, respectively. The coumarin adsorption capacity on SG-1,10-PhenanNTf2 obtained from the pseudo second-order kinetic model (92.72 mg∙g−1) was also in good agreement with adsorption capacities obtained from adsorption isotherm experiments (85.29 mg∙g−1) and from the Langmuir isotherm model (88.77 mg∙g−1), supporting the highest applicability of the pseudo second-order nature of the adsorption of coumarin by SG-1,10-PhenanNTf2. Figure 4. 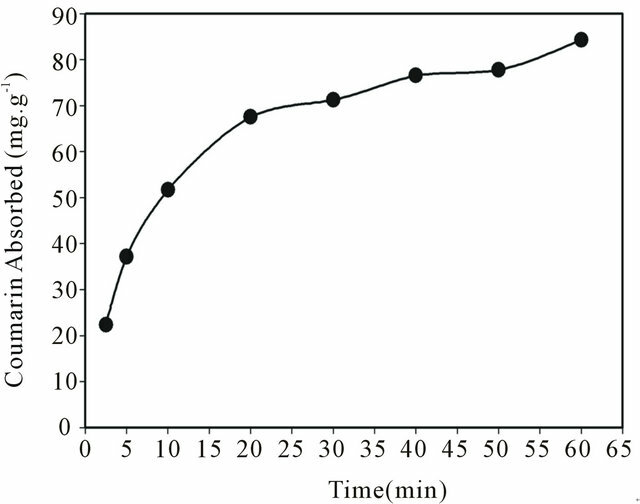 Effect of shaking time on coumarin uptake using 20 mg SG-1, 10-PhenanNTf2 phase at 25˚C. Figure 5. Pseudo second-order adsorption kinetic model of coumarin uptake on 20 mg SG-1,10-PhenanNTf2 at 25˚C. under optimized conditions. A model standard solution containing fixed amount of 150 mg∙L−1 coumarin with mixed matrix compounds, including 150 mg∙L−1 flavone, naphthalene and phenanthrene, was treated according to the recommended procedure. As shown in Figure 6, it can be clearly observed that coumarin was retained more than other compounds, providing that the SG-1,10-PhenanNTf2 adsorbent was most selective toward coumarin. Calculated uptake capacity and distribution coefficient values are reported in Table 2 for each compound adsorbed on the SG-1,10-PhenanNTf2 phase in this mixed matrix. As displayed in Table 2, coumarin had the largest static uptake capacity, qe, (76.38 mg∙g−1) and distribution coefficient, Kd, value up to 859.11 mL∙g−1 on the SG-1, 10-PhenanNTf2 adsorbent as compared with other compounds in the mixed matrix. The effect of medium composition containing mixed compounds has, therefore, no significant influence on the extraction of coumarin. Thus, the selectivity of the proposed method is high enough to be applied to the determination of coumarin in real samples. In order to establish the validity of the proposed procedure, the method was applied to the determination of coumarin in real water samples. A standard addition method was performed under the same batch conditions to estimate the accuracy of the extraction of coumarin. An amount of 5, 10 or 20 mg∙L−1 coumarin was spiked in three different types of water samples, including ground water, lake water and waste water, collected from Jeddah in Saudi Arabia. 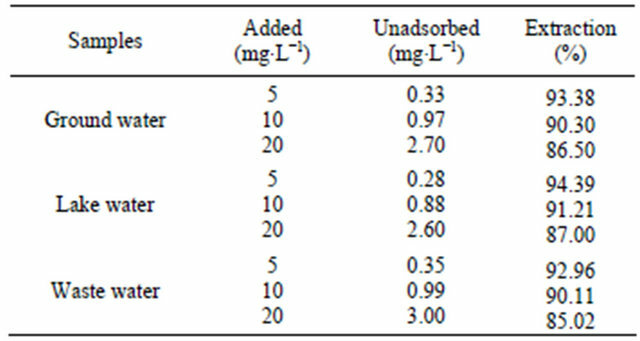 The % extraction of each amount of coumarin in real water samples was calculated, and the results are summarized in Table 3. As can be observed in Table 3, the % extraction of coumarin in real water samples was reasonable, in the range of 85.02% - 94.39%. In addition, it is interesting to note that the unadsorbed fraction of coumarin was largely decreased when the added fraction was increased to 20 mg·L–1. In fact, this behavior can be ascribed to the low adsorption capacity or rate for interfering chemical species presented in real water samples toward the SG-1,10-PhenanNTf2 phase. Thus, results suggested that the extraction of coumarin in spiked water samples was satisfactory for trace analysis and apparently demonstrated that the method is reliable, feasible and suitable for analyzing real samples. Table 2. Effect of matrix interferences on the extraction of 150 150 mg∙L−1 coumarin on 20 mg SG-1,10-PhenanNTf2 (N = 3). Table 3. Determination of coumarin at different concentrations (5, 10 and 20 mg∙L−1) in real water samples using 20 mg SG-1,10-PhenanNTf2 (N = 3). Figure 6. Effect of matrix interferences on the extraction of coumarin by 20 mg SG-1,10-PhenanNTf2 at 25˚C. Adsorption experiments were performed with 150 mg∙L−1 coumarin, flavone, naphthalene and phenanthrene mixture under batch conditions. water samples with complicated and variable matrices. The authors gratefully acknowledge the Department of Chemistry and Center of Excellence for Advanced Materials Research at King Abdulaziz University for providing research facilities. M. R. Pourjavid, P. Norouzi and M. R. Ganjali, “Light Lanthanides Determination by Fast Fourier Transform Continuous Cyclic Voltammetry after Separation by IonExchange Chromatography,” International Journal of Electrochemical Science, Vol. 4, No. 7, 2009, pp. 923- 942. L. Yu, D. Garcia, R. Ren and X. Zeng, “Ionic Liquid High Temperature Gas Sensors,” Chemical Communications, No. 17, 2005, pp. 2277-2279. H. Freundlich, “ÜBer Die Adsorption in LöSungen (Adsorption in Solution),” Zeitschrift für Physikalische Chemie, Vol. 57, 1906, pp. 384-470.